Under the Nazi regime, all music produced had to fit within certain standards defined as "good" German music. Suppression of specific artists and their works was common, yet musicians were permitted limited artistic freedom. The Nazis attempted to create a balance between censorship and creativity in music to appease the German people. Loyal Nazi members who were talented musicians were guaranteed a job. Loyal Nazi members who were not talented musicians were not guaranteed a job. Any non-Jewish person who demonstrated a "genius" for music and was a member of the Reichsmusikkammer (Reich Music Chamber) was permitted employment. This exception in policy permitted musicians like conductor Wilhelm Furtwangler and composer Richard Strauss to continue working. According to Hitler and Goebbels (Hitler's second in command), the three master composers that represented good German music were Ludwig van Beethoven, Richard Wagner, and Anton Bruckner. All three composers lived prior to the 20th century. Ludwig van Beethoven (1770-1827) believed that "strength is the morality of the man who stands out from the rest." Hitler identified himself with Beethoven as possessing that heroic German spirit. Beethoven was so loved by the German people that his legacy of music was unrivaled by any other composer. Listen to a sample of Beethoven's Ninth Symphony. Ludwig van Beethoven biography and picture gallery at the Classical Music Pages. Adolf Hitler (front row on aisle) listens as Wagnerian conductor, Dr. C. Muck, leads the Leipzig Orchestra. Richard Wagner (1818-1883) was Hitler's favorite composer. During World War I, it is reported, he carried Wagner's music from Tristanin his knapsack. Often Hitler had Wagner's music performed at party rallies and functions. Wagner's music was uncompromisingly serious, and intensely Teutonic. It was not only Wagner's music that 'struck a chord' with Hitler, but also his political views. Wagner wrote a violently antisemitic booklet in the 1850s called Das Judebthum in die Musik (Judaism in Music) insisting the Jews poisoned public taste in the arts. He founded the Bayreuth festival, which in the 1930s and 1940s was used by the Nazi party as a propaganda tool against the Jews. Listen to a sample of Die Walküre (Ride of the Valkyrie). Short biography of Richard Wagner. Richard Wagner biography and picture gallery at the Classical Music Pages. Anton Bruckner (1824-1896) considered himself a disciple of Wagner. Bruckner and Wagner were contemporaries composing much of their music between 1845-1880. Bruckner met Wagner in 1865 at the premiere of Tristan and Isolde in Munich. He dedicated his Third Symphony to Wagner. Music historians have referred to Bruckner's Adagio of the Seventh Symphony as the Adagio of premonition. It is music written with funerals in mind. Wagner died shortly after Bruckner finished it in 1883. Like Hitler, Bruckner had humble beginnings. He never forgot his "peasant roots." Much of Bruckner's early training and education was under the guidance of Augustine monks. He had a genuine love of nature and "the great German Fatherland." To Hitler, Bruckner exemplified the people. 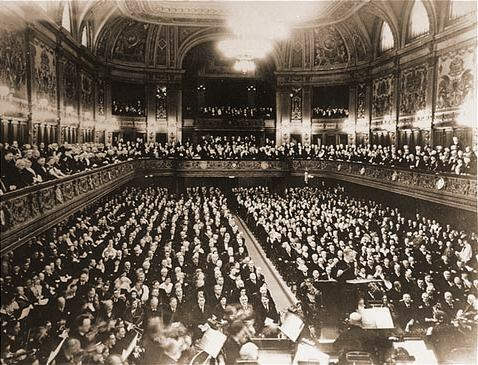 A movement from Bruckner's Seventh Symphony was played upon the news of Hitler's death in 1945. Anton Bruckner biography and picture gallery at the Classical Music Pages. Most musicians and composers who lived during the Third Reich were less fortunate in their ability to please the Führer. For many musicians, survival meant compromise. Many tried to strike a balance between allegiance to Germany and commitment to their work. It was a difficult balance to achieve, knowing that to fail meant deportation or perhaps death. The following musicians were all involved to some extent with the Third Reich. Hans Hotter (b. 1909) is a classical opera singer Hitler regarded as "the greatest baritone of the future." Even though Hotter was not a member of the Nazi party and had been known to make fun of Hitler at parties, he was given several prestigious positions within the Reich. Repertoire and selected bibliography for Hans Hotter. Herbert von Karajan (1908-1989), a wealthy gifted musician and conductor, was the youngest director of an opera company in Germany in the 1930s. In order to obtain better conducting positions, Karajan joined the Nazi party where it was rumored he bought some of his appointments. After the war he was banned from conducting until 1948. He became the permanent director of the Berlin Philharmonic Orchestra in 1958 and was considered one of Europe's most popular conductors. Clemens Krauss (1893-1984), the illegitimate child of the Archduke of Hapsburg and a Viennese actress, was an accomplished opera conductor. He was a favorite of Hitler, though he was not a Party member. Krauss became a captive of Hitler's music ministry. Though he tried to be transferred to Vienna on numerous occasions, Hitler insisted that he work in Munich. A short biography of Clemens Krauss. Elly Ney (1882-1968), the daughter of a music teacher and an army sergeant, was a child prodigy. When she was ten she had a Jewish piano teacher at the Cologne Conservatory. She disliked her teacher immensely, because of his race. In 1933 she was asked to fill in for a Jewish musician who had been banned from performing, she regarded this as an insult, and said she only managed to do it by concentrating on the music. Hans Pfitzner (1869-1949) called himself a German genius. He was a rabid nationalist who believed that all art should serve the Fatherland. He once tried to persuade Mahler that the most essential feature of Wagner's music was that it was German, rather than good. Mahler responded that all great artists leave their nationality behind and strive to produce a masterpiece. Pfitzner left the room in a fit of rage. He was compared to Strauss, yet is almost unknown today. His most famous opera was Palestrina. A short biography of Hans Pfitzner at the Classical Music Pages. Caricature and recommended recordings of Hans Pfitzner. Li Stadelmann was a harpsichord player who specialized in Bach's music. She joined the Nazi party in 1933, stating, "Our German masters will find German interpreters." She was an antisemite, who felt that Jews had no place in German culture or society. Richard Strauss (1864-1949) was appointed president of the Reichsmusikkammer (Reich Music Chamber) when Hitler came to power in 1933. Strauss accepted it as a way to get legislation passed which would benefit "serious" composers in a country he felt had become too commercial in its musical taste. His primary interest was purely musical, whether or not a person was Jewish was irrelevant to him. He regularly refused to fire Jewish musicians and continued to work with Jewish librettist, Stefan Zweig. In written statements to Zweig he indicated his aversion to political policies. This politically incorrect stance put him at odds with the Nazi government. Goebbels felt Strauss was opportunistic and distrusted him, considering his music borderline German. Only his worldwide fame kept him from being a "persona non grata." Because Strauss had Jewish relatives (his daughter-in-law) he was forced to deal cautiously with the authorities. There is a story that he attempted to visit his daughter-in-law's mother who was imprisoned at Terezín. The camp guards refused him entrance. Her photograph was returned to Strauss soon after her death. Strauss was forced to resign in 1935 after which time his music was censored by the Reichsmusikkammer. The Richard Strauss Page, a hotlist of Internet resources on the composer. Lyrics and background information about the Horst Wessel Song, the Nazi anthem.